Maybe its old but ive just seen it, ive seen threads on it but no pics. Mods delete if old. ...which reminds me, the NBA Live cover jinx didnt work on DWADE. That's because Wade is not a football player, and Live is not Madden. Yeah, it's the Madden curse, not the all-EA-sports-games-curse. Yeesh, people just trying to find another reason to fawn over Wade I think. Looks like a decent cover. Who's gonna be on the cover of 2K7? Anyone know? Shaq was on the 2006 cover of NBA 2k and Wade was on the 2006 live cover. 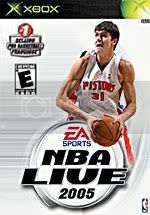 We just need Yao to make the NBA 2k7 cover! Guaranteeing the Houston Rockets a 2007 championship! I think Number8 is right on, I heard it is Kobe on the cover of 2k7. anyone wanna explain to me what this EA curse is about? They had to photoshop the crutches. Every NFL player who's been on the cover of Madden for like the last ten years has a sup par - and sometimes even bad - season subsequently. Without fail. It's really weird. "Yeesh, people just trying to find another reason to fawn over Wade I think." ****, my man-crush is out of hand. "That's because Wade is not a football player, and Live is not Madden." Oh, it was football. Im so ignorant at times. "They had to photoshop the crutches." I wasn't referring to you specifically. I've seen several people say the same thing. I think it's just part of the recent Wade fad.